For those who don’t already know, in December, we got our license to sell and even taste local Michigan beers and wines! We work hard to get new and exciting beers as well as hard to find wines for our customers looking to taste the best of Michigan! Today, we are excited to announce that we recently welcomed Dragonmead Brewery to the choices here at Tip’n the Mitten and further pleased to announce an upcoming tasting event! On July 8, we invite you to stop in from 3:30 pm to 6 pm to meet the fine folks of Dragonmead and enjoy a taste on us! Dragonmead is a Michigan craft brewery located in Warren, MI. Founded in 1997, Dragonmead has developed a cult following of people who enjoy a great craft beer with a unique flair. 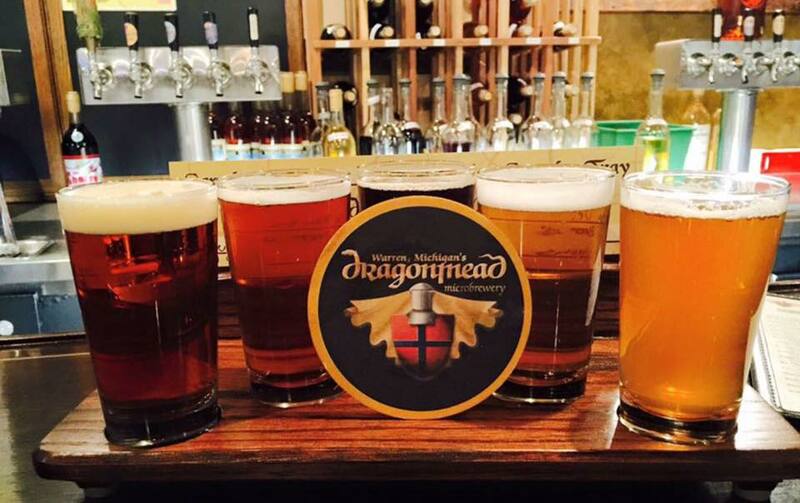 Dragonmead brewery was founded in 1997 well ahead of the craft beer revolution in Michigan. Our mission is to produce beer so very good that it changes the very nature of the industry. For over 18 years we have accomplished our goal. Visitors to the Taproom can enjoy over 40 different styles of beer served along with over 15 selections of Dragonmead made wine and mead. Sampler platters are available for either our beer or mead and wine. Our staff is knowledgeable regarding our beer styles and can make recommendations based on your taste preferences. A limited food menu is available and entertainment is provided on Saturday nights. Experience the ambiance of old-world service and style with a modern-world taste. We are proud to represent the microbrew revolution in Michigan. An Irish style red (Amber) beer. The Irish style is accomplished by using a true Irish yeast strain in fermentation. Light in finish but bold in taste. Melanoidin malt is added for the red color and the spicy finish comes through from the use of Chinook hops. Alcohol By Volume 5%. We are pleased to be able to carry these tasty craft beers and look forward to welcoming the folks from Dragonmead here on Saturday, July 8th to Tip’n the Mitten!